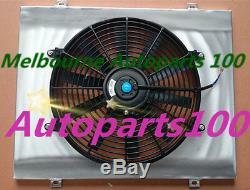 For Holden Commodore Radiator+Shroud+Fan VG VL VN VP VR VS V8 52m Alloy AT MT. Holden Commodore Statesman Caprice VL VN VG VP VR VS Q V8 5L HSV SS. (Just leave Oil Cooler disconnected if manual). Core size: 545mm × 435mm × 52mm. Overall size: 670mm × 460mm × 65mm. Come with two build-in transmission oilcooler. Radiator Cap: 1.1 Cap included. 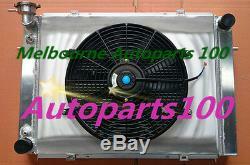 Package Included: one Aluminum Radiator + one Aluminum Shroud + 14 Inch 12V 80W Thermo Fan (including mounting kit). Full set in box and 100% brand new. Professional installation is highly recommended. We are a legal local company, and. 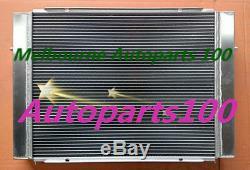 We provide car radiator replacement and installation service and general car service. Bank Deposit(Australia buyers only). Australia Post and Fastway Courier depends on your location. We will arrange for a replacement to be sent as soon as the item is received by us. International buyers - Please Note. All shop order, bulk order, wholesalers are welcome. We also accept made-to-order items(we can build one for you). 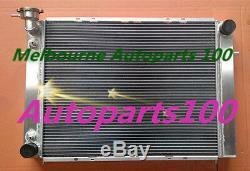 The item "For Holden Commodore Radiator+Shroud+Fan VG VL VN VP VR VS V8 52m Alloy AT MT" is in sale since Monday, June 15, 2015. 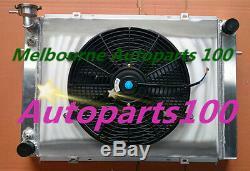 This item is in the category "Vehicle Parts & Accessories\Car & Truck Parts\Cooling Systems\Radiators". The seller is "worleydfo" and is located in Tarneit. This item can be shipped worldwide.